Install Ubuntu from Windows in 3 Steps without Using a CD I can't help thinking about the days when, if you wanted to install a Linux distribution on your system, you had to go through a messy repartitioning of your hard drive, burning the distribution's image on a CD (or several CDs – there where no DVDs around those times) and, finally, figuring out what to do with the newly created CDs. If you were lucky enough you had a semi-working OS on your machine that needed numerous tweaks, fixes and other things like these until it worked fine. And I'm not talking about getting it to work exactly how you wanted it to... just getting it to work. Nowadays, installing a Linux flavored OS on your computer shouldn't be such a hard task to accomplish because there are tools out there that do it without you having to juggle around with your hard disk's partitions and even give a damn about what is happening under the hood. These days, we have come to a point when we can install Linux from inside our Windows OS by using a native Windows executable. One of the multitude of such programs is Wubi (Windows based Ubuntu Installer), the one that I picked to present you before starting this article. The thing that will surely amaze you is not that Wubi will install Ubuntu (with its flavors: Ubuntu, Kubuntu, Xubuntu, Edubuntu, UbuntuStudio) on your system without you having to deal with a mind-blowing row of tasks before finally having it ready to run, but that it will not affect your file system in any manner. As you can read on Wubi's FAQ page, "Wubi adds an entry to the Windows boot menu which allows you to run Linux. Ubuntu is installed within a file in the windows file system ( c:wubidiskssystem.virtual.disk ), this file is seen by Linux as a real hard disk." So, you see, nothing gets changed in your Windows OS and there is almost nothing to it. In three unbelievable easy steps, anyone – even people that have never seen the looks of a Linux OS – can install Ubuntu on their computer. 3. 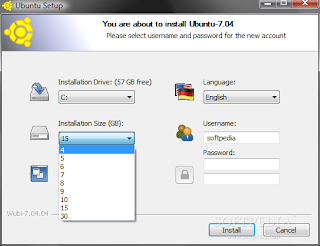 Select the password to be used while installing Ubuntu and click Install. And presto, you have a fast, good-looking and (I think) very easy-to-use Linux distribution running right beside Windows in a dual boot environment. The only thing that you really have to think about when beginning to install Ubuntu using Wubi is to decide how big the installation size should be. From what I've learned so far, 10 GB of space would prove more than enough for everything you might think to do when using it. But, if you think you'll need more and you have the necessary space (and I bet most of you do) you could give it about 20 GB to be sure everything will go as smooth as you'd want it to. Keep in mind though: unlike using a paid software, when using Wubi (which is a free application) there are no warranties, therefore you run Wubi at your own risk. Despite this warning coming from the program's developers, I have never heard about a case when things have gone wrong. What remains to be said now? Just enjoy Ubuntu and get back with a comment if everything is OK. If not... well... I’m impatiently waiting to hearing from you.